A livewire youngster who was extremely light when Collingwood drafted him from Gippsland Under-18s, after he had originally come from Leongatha. 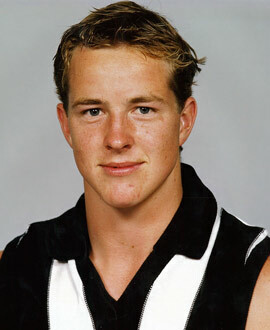 He had a learning year in the reserves in 1999 then made his AFL debut in the opening round of 2000 and made an instant impression with his clever use of the ball and three handy goals. Quick and lively, his form did tail away towards the end of the season although he did manage18 senior games in his debut season. Nagging groin problems delayed his start to the 2001 season by two months and he played only one senior game, but looked below par and spent the rest of the year in the VFL. In 2002 he took until the 17th round to win a senior place, but after a promising return was dropped just before the finals and it was no shock when he was subsequently traded to West Coast. He played eight games late in 2003 mostly off the bench. Adkins had a patchy start to 2004, but had a few good games. He was dropped in mid-season, but returned for the closing stages and was mainly used off the bench. He was an emergency for West Coast’s Grand Final loss to Sydney in 2005.